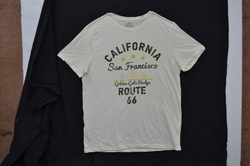 we offer eclusive Range of Mens Basics, Casual and Designer T-shirts under the Brand Name Doggers available all over India in various Multi Brand Outlets. We specialise also in Processing corporates and Institutional orders for Ments, Ladies and Kids. With the assistance of our talented team of employees, we have acquired a reputed standing in the nation by offering a huge range of Men Plain Polo T Shirts. Using fine and quality rich fabrics altogether with advanced machines; these are designed in line with the quality standards and values laid down by the industry. Look smart and elegant in this Long sleeved T-shirts. These Mens long sleeve T shirt are available in various sizes.